A longtime dream of both Andrew’s and mine has been to rent an RV and drive around the west visiting national parks to view the beauty of our country. Well we made that dream come true last week. In addition to hiking all five national parks in Utah, two state parks, and the North Rim of the Grand Canyon, we had many adventures. Some of our adventures were food related and mostly delicious. For lunch one day Andrew made hummus and salad wraps that were surprisingly scrumptious. 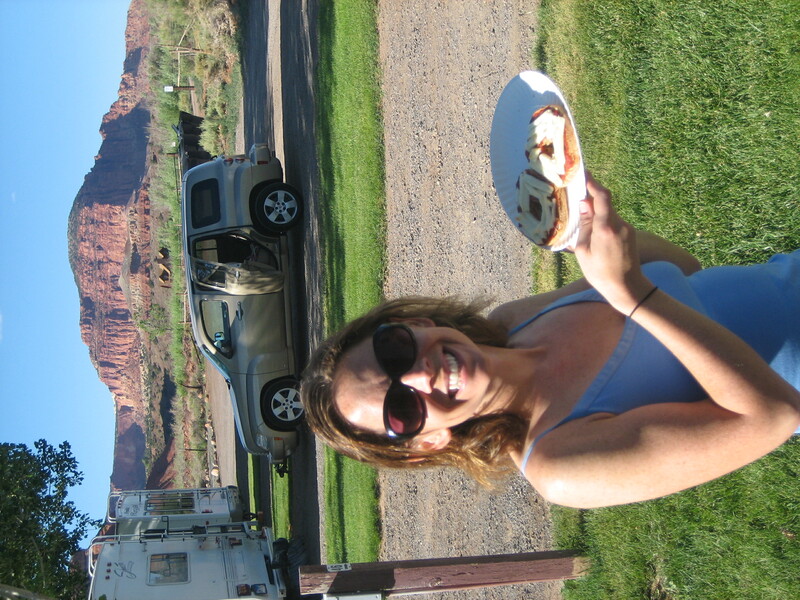 While staying in the Navajo Tribal Park at Monument Valley we ate a traditional Navajo Taco, delish. And so I wouldn’t fall behind in my pizza project, I made RV Pizza. This pizza was definitely a challenge, not having my Kitchenaid mixer, fresh dough or my oven. Improvising, I used Pepperidge Farms bagels, Prego, and mozzarella string cheese. The RV had a microwave/convection oven combination so I attempted to bake them using the convection setting. I stood in front of the machine watching the pizzas spin around because I had never used a convection oven before. I waited for the cheese to melt to know they were done, but the cheep string cheese we bought didn’t end up melting so I took them out when the cheese looked brownish. They didn’t taste bad, but we were famished from having hiked Bryce Canyon earlier that day so anything would have probably tasted good! This entry was posted in cheese, marinara, mozzarella, sauce, Uncategorized and tagged pizza, RV food, rv pizza recipe. Bookmark the permalink.